I’ve heard these hardheaded Russian devils eat fat. In my Second Third, I hope to feed it well. My senior year of high school, I stood about six feet, two inches. During football season that fall, I weighed around 175 pounds; I started wrestling season alternating between 171 and 189 — wherever the team needed me — and by midseason I was a lean, mean 152 pounds, wrestling 160, 171, and 189, plugging holes in the lineup to keep us from forfeiting. I could make weight with my gear on most days, was well-fed, had good energy — and wrestled my best season (which was only a little above .500, but still…). A year later I entered an intramural wrestling tournament at Yale, weighing in at around 185. All-you-can-eat dining halls and student lethargy were taking their toll; was exhausted even wrestling short periods, and threw up in a snowbank after my first. I was still hovering under 200 when Jodi and I met in Wall. We married, settled in a bit, started having kids…and I have always joked that I put on sympathy weight with each child, only unlike Jodi, I’ve never taken it back off. This explains why, 15 years after we married, I’ve gained 40 plus pounds. Ten per child, see? I’m told by friends that there’s no way I weigh 240 these days; when I insist, they say I carry it well. Perhaps so (and thanks!) — but what had long been a joke seems less funny this summer. After seven years, we’re expecting again, and I feel as though I’ve been busier and more active than I’ve been in a long time — except that the scale today is pushing 250. Two hundred and fifty pounds? An eighth of a ton?! I’m 36. I don’t have the energy to pack that extra weight around for no reason. Plus my 13-year-old is getting bigger, faster, and stronger by the minute. Thus far I still intimidate him. I need to keep it that way — but more Chewbacca, and less Jabba the Hutt. So. 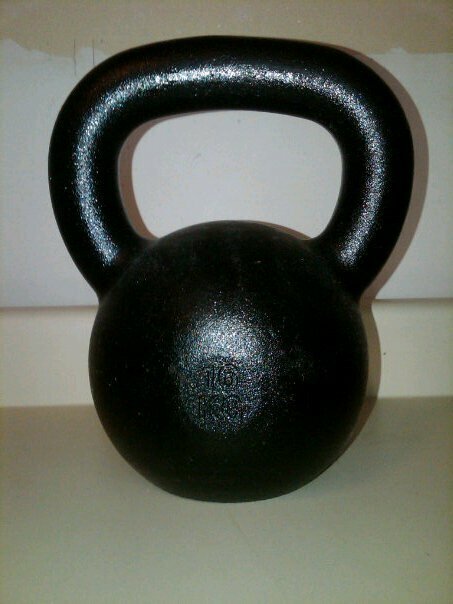 My training komrade is a 35-pound cannon ball with a handle. It’s simple, compact, and I’m told it will kill me or cure me. I say cure, since I plan to live to 105. Wish me luck. I’ve had a number of conversations in recent months about the delicate ethics and art of downsizing one’s list of Facebook friends. Some are aghast that I would ever do such a thing; others wonder why I would accept the Facebook friendship of someone I might later “unfriend” in the first place. I try to assure them that, in most cases, it isn’t personal. I generally accept friend requests from anyone I am acquainted with; if, after the initial reconnect, we appear to no longer have anything to say over a period of several months, I may unfriend them. “Unfriend” is an unnecessarily harsh term – as I see it, we are just as close as we were before Facebook; we just don’t have to wade through extra content not meant for, or meaningful to, us. In a few rare instances, however, I have unfriended folks on Facebook because being around is just too difficult. Perhaps our views are so different that I find myself constantly biting my tongue to not start a fight. Perhaps they expect too much interaction, when I don’t feel as connected or close. And truth be told, this happens in the real world, too. The older I get, the more disinclined I am to spend time around people who inspire tension or unease in my life. I struggle a bit with this. Occasionally, I’ll feel an “unfriendly” impulse, only to, upon further reflection, realize that I am simply being impatient or selfish, and that I must take a deep breath and respond to this person as all people deserve..with love. But it’s a fine line between bearing a cross and loving my neighbor or my enemy, and simply being cross – enduring the company of a person who, without reservation or apology, pushes all my buttons and brings out the worst in me, to the chagrin or detriment of those for whom I care. The other day I left my office and walked to rest room, passing, in the process, a person who had long been a thorn in the side of my colleagues and I during a previous job. With welcome relief, I noted that my blood pressure didn’t rise when I saw our former adversary; in my new role, these past conflicts were no longer relevant, and so the person was just a person, and I was free to have no opinion. That, to me, is what I hope to better embrace in my Second Third: who to embrace, who to avoid, and when to gracefully bow out and feel free to have no opinion. I hope the latter option because increasingly prevalent, because each of the former two is exhausting in its own right. I got just enough of the can-do attitude to believe, just after we were married, I could change the water pump in my car with a socket set, a couple screw drivers and wrenches, and a Xeroxed copy of the Chilton’s instructions in the open parking lot of our first apartment in Sioux Falls. When the landlord came out halfway through the procedure to point out that Jodi’s lease forbade auto repairs on the premises, I apologized, but suggested it might be best to let me finish and clean up the mess than to snarl things any further. I’ve retrofitted a flush-mount ceiling fan to hang on the level from a sloped cathedral ceiling. I drew the picture my sister projected and painted on Emma’s wall. I did these things because somebody had to do them, and I was available. But I don’t necessarily go out of my way to look for new challenges of this sort. So this past week, Jodi and I looked at the calendar and realized that Gabe was registered for a mid-day soccer camp, and both of us had to work. We suggested he ride his bike a mile or so up the road to the middle school on quiet residential streets and paved bike paths, for the most part. We also suggested that Brendan accompany him on his bike, with his cell phone – at least on the first trip – to be sure Gabe didn’t have any problems. I was informed that Bren hasn’t really been riding his new bike much since last summer, mostly because he didn’t “get” the gears: he couldn’t find one he liked, and whenever he shifted to another, the chain made annoying noises. Gabe’s problem was more practical: he wasn’t sure how he could ride a bike and carry his soccer ball at the same time. I was exasperated. When I was their age (and younger! ), I stripped all the “extras” off my BMX – chain guard, reflectors, handbrake, etc. – because I wanted the lightest functional bike possible, and I rode my bike to the lake near our house with a lifejacket, tackle box, fishing pole, and bucket for the catch, without issue or explanation. I explained to Brendan that he should take a minute to look at his sprockets as he shifted gears, and when his chain was making noise, so he could see what was going on – that most of the time, you just need to back the shifting mechanism off slightly once you changed gears to make the noise stop. I suggested to Gabe that there was a hands-free way to carry stuff to school that would work just as well on a bike as it does on foot: his backpack. I assured them (somewhat sharply) that they could handle this little adventure – and might even enjoy it. Only later did it occur to me why I was that way as a kid (and as a newlywed). My dad did all his repairs – auto repairs, home repairs, you name it – himself, and required me to be with him, come sunshine, rain, or snow. I didn’t have “the knack,” but I learned to look more closely at how things worked, and learned which tools did what, and where to find them. After hours in the shop, working on my bike was a piece of cake. And Mom and Dad set clear boundaries and rules, then gave me the freedom to roam the neighborhood, the woods, and even the docks and beaches, playing, exploring, fishing, and even hunting. If I wanted to take advantage of this freedom (and make the most of my time) I had to figure what I needed and how to transport it. We built forts in the woods, repaired bikes on the road, camped on islands in the middle of the lake, without anyone carting me around. you’re gonna need a bigger room. sitting in your little room. I tend to obsess a bit once I get an idea in my head. It’s frustrating at times to both Jodi and me, because I find it difficult to concentrate on other things, and the more I dwell on the object of my obsession, the less inclined I am to wait for a pay-off. I’ve been this way forever, I think, but first recognized it clearly around 2002, when the band The White Stripes released their recording White Blod Cells. I caught them accidentally on Saturday Night Live, liked what I saw, and went to a local CD store to pick up the disk. I had heard they had release a limited edition disk with a bonus CD-DVD that included a couple extra tracks and music videos, so I figured I’d pick that version up. I guessed it would be about $15, maybe $20 with the DVD. I got to the store over lunch, I think, after stewing all day on the prospect of new music. I didn’t have a lot of time, and the store didn’t have the limited edition with the bonus disk. Furthermore, they were asking $20 plus tax for just the regular CD. I knew I could get it cheaper at another place, but didn’t have time to run there. I wanted that disk. I needed that disk. I loved the music, but now began to obsess over the missing bonus CD-DVD. A day or so later I passed a display in a different store: The White Stripes Limited Edition White Blood Cells CD plus bonus CD-DVD, only $17 (or something like that). My heart sank. I couldn’t justify spending money on the package just to get the bonus disk. I should’ve waited. Some weeks (months?) later, I found the bonus disk for sale, by itself, on eBay. I bought it; with shipping it probably cost $10. $30-plus for something I could’ve had for $17 plus tax. And the bonus disk wasn’t that great. There is a point: Now, as I’m working from home on longer writing projects and trying to finish a novel, I’m again obsessing over ideas and wanting to rush headlong toward the finish. On the University side, I’m wading through reams of detailed background material right now, and I’m not writing, even though I very much want to. I keep thinking, “I know this material!” and wanting to shove it aside and type away, but I’m forcing myself not to. The reason? I tend to write my first drafts in close to final form, so that I have a cohesive, easy-to-read whole at the end. That’s wonderful, but it makes it more difficult to revise and add material later, because it leaves few openings (and often I’m wedded to the words already on the page). Similarly, the novel I’ve been working on for 15 years now has stagnated because when I started it, I rushed headlong forward, improvising on a very general idea of where I wanted the story to go. Now what I have are several tightly drafted sections that hint at a great story, but they need fleshing out and more direction. So at this late date, I’m finally taking a big step back and patiently sketching (with words) whose story this is, who the characters are, what they care about, what they want to achieve. I want to ditch this step and just write, because for the first time in a long time, I’m getting excited again…but I know I need to plot it out a bit more carefully if I want to make sustained progress toward a completed book. And you know what? I’m getting to know things about my characters that I hadn’t guessed before! Fruits that are allowed to ripen are sweetest and juiciest just before they spoil. Patience and careful attention to what I’ve set out to do, I think, will be more important than ever in my Second Third if I hope to enjoy the full flavor of the things I love. Sometimes it appears that I am unable to go with the flow. This is not true. (No, it isn’t!) I can absolutely go with the flow. But once I have a plan, I have a hard time adjusting it or letting go. I have a good reason for this — one that cropped up again today. As a writer, I have to push myself to get work done in a reasonable timeframe, and now that I’m able to work from home (surrounded by potential distractions) I have to be even more structured with my time. So I’ve got my work week carved into blocks of time for specific projects, for writing, for catching up on reading and administrative tasks, etc. It is my intention to cultivate discipline in myself…unfortunately, this morning I woke up feeling quite ill and started the day slow. Then I started to spread myself out in my home office space and realized I didn’t have enough open work surface for the project, so I had to do some rearranging. By the time I got situated, I was supposed to be moving on to the next project. I didn’t achieve much that I set out to. Tomorrow must be a better day than today, or I’ll be seriously behind my self-imposed deadlines. And even though they are self-imposed, if I don’t take them seriously, I’ll never accomplish anything. Similarly, today is my bride’s birthday, and I wanted it to be special. I’ve spent the past several days thinking about how to achieve this and formulating plans in my head: how can I give Jodi exactly what she wants, and surprise her? What does she want? The bathroom repainted, relit, recaulked, etc. ; a new curtain or blind for the kitchen window; and (eventually) new bedding. And to go out for supper. And a pineapple upside-down cake. I knew, based on what we have scheduled this week and weekend, that the bathroom was not going to get done until next weekend at the soonest…and since we’re still trying to narrow down what she wants for the kitchen window, I urged her to consider moving the bedding up on her list of priorities, because we had done a little looking already and that was something I could do tonight. After all, I wanted her to have something to open. I also planned to have lunch with her today, and supper out, and then cake. It was going to be great! I was going to pull lunch together with the kids, but people kept calling Jodi, so I was working while she talked…and next thing I knew, she was cooking something for lunch. Strike one. We talked a bit about her “home improvement” gifts, and I thought I’d slip quietly out to get what I needed for the cake and come back with the bedding we had looked at…except then she said we should shop some more — at least at JC Penney and Bed, Bath, and Beyond — before we purchased anything. Strike two. At least I could still make a cake. Jodi and I discussed supper plans. There was a fair chance that wherever she decided to go, we would get dessert. Tomorrow is Gabe’s birthday — we will celebrate it as a family, but he’s having a party (and his cake) on Friday. “That sounds good,” said Jodi. I spent the afternoon stewing. Jodi made lunch. Jodi had no presents or cake. All she had to mark the day was a card, or best birthday wishes, and dinner out. That had better be good! Except that now all four kids were expecting fries. Jodi ordered chili cheese fries instead of potato skins. Then, just before we ordered our entrees, she announced she was ordering a sandwich — one of the cheapest things on the menu. She ate her sandwich, her fries, and a small dish of complimentary ice cream and chocolate sauce. We stopped at JC Penney on the way home and looked but did not buy. And I couldn’t help myself: on the way home, and at least once after we got back, I apologized for not making the day more special. She may have had a point there: Brendan and I were both miserable from eating too much, and Gabe brought most of his home. I had plans and couldn’t let them go. I wanted things to be perfect, and wound up driving my bride slightly batty today. In my Second Third, I need to learn when to stick to my plans, when to be flexible, and when to let go.